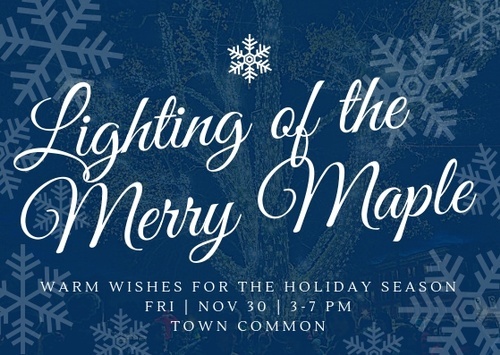 to ring in the holidays with annual Lighting of the Merry Maple Ceremony. Atkins Cider Donuts and Cider will warm you up. Music from UMass Marching Band, Amherst High School Chorale and Hurricane Singers, and new this year, the DQ A Capella of Amherst College. Story time, crafts, and photos with Santa and Flakey at Strong House. Wagon rides from Muddy Brook Farms are back. And without the Amherst Business Improvement District, there would be no lighting. So let the festivities begin! Thank you to our partners Atkins Farms, UMass Marching Band, Strong House, Muddy Brook Farms, our Amherst Fire Department and Amherst Police Department, and more who make this event possible. Atkins Cider Donuts & Cider under the Chamber Tent!